I’m a huge fan of the VLOOKUP function, and am surprised by its day-to-day utility for accountants. In this post, we use the VLOOKUP function to convert or translate calendar year transaction dates into fiscal year periods, such as a fiscal quarter. To accomplish this, we’ll first need to investigate in detail the function’s fourth argument, the range lookup argument. Let’s begin. [range_lookup] – true or false, are we doing a range lookup? The fourth argument, the optional range_lookup value, is the argument that enables us to easily translate dates into fiscal quarter groups, or, perform any other range lookup. So, what is a range lookup? It means we are trying to find a value between two endpoints. The word range here doesn’t refer to a worksheet range, such as A1:B10. It refers to a range between two values, such as a number between 1 and 100, 101 and 200, or in the case of dates, between 1/1/14 and 3/31/14. We are trying to find our lookup value within a range of values. Since this argument is optional, Excel users are not required to actually express a value…that is…we can leave it out of the function. The default value, if omitted, is TRUE, as in, true, we are doing a range lookup. The value of FALSE means we are not doing a range lookup, we want an exact matching value. In our case, we want to do a range lookup and so we’ll use TRUE for our formula. We have a from date, a to date, and a quarter label. We’ll look up the transaction date in the table to determine the quarter label. 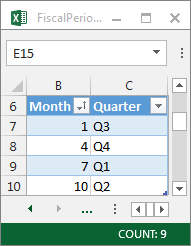 The formula essentially finds the date in the lookup range and returns the quarter label. This works because the VLOOKUP function only looks for its matching value in the first column, the lookup column, and ignores other columns. After a match is found, then the function slides to the right to return a related result, in our case, the quarter label. Quick question for you: does the quarter lookup table need to be sorted? Yes, if the fourth argument of the VLOOKUP is TRUE, then the lookup range must be sorted in ascending order by the lookup column for it to return a reliable result. We can do even better than the formula above. The lookup table above works for a specific fiscal year, but requires us to add new rows each subsequent year. Since our goal is to eliminate manual steps from recurring processes, we’ll need to figure out a way to create a lookup table that works for all years. Fortunately, Excel provides the MONTH function which pulls the month number out of a date. By nesting the MONTH function in our VLOOKUP function, we can simplify our lookup table to include only months, as shown below. Remember, the lookup table needs to be sorted in ascending order for the function to return a reliable result. Since this table includes months only, it can be used for transactions that span many fiscal years. And that my friend is my preferred method for translating transaction dates into fiscal periods. If you have other methods, please share by posting a comment below…thanks! Nice explanation and demonstration. Keep it up. How do you attach the Year to the output. I can’t just have “Q1”. I need “Q1 ’15”. Any help here? Sure…all you would need to do is update the values in the Fiscal Period Table to include the desired labels, for example, change the table values from Q1, Q2, Q3, and Q4, to include the year, such as Q1 2015, and so on. I have one spreadsheet with a date of 26/06/2015 but when I do a Vlookup in a different spreadsheet the date comes back as 30/06/2019. Very clear explination! Has helped me simpllfy the fiscal year juggling act! You mention the advanced option as not having to add new rows. I don’t quite understand how this is avoided. As your ledger moves forward (ie, “grows” in time), won’t new rows have to be added as time advances? That would be in either scenario. Maybe I’m missing it! Great advice and help – but would love some clarification how to avoid extra manual steps! Glad to help! You won’t need to update the table rows in the advanced version because the only element considered is the month, and not the year or day. That means that your lookup table need only contain four rows. For a working sample of this technique, download the sample Excel file and check out the All Years worksheet. Great thanks problem solved ! I tried to create a lookup using the “simple” method you described. I defined an “employee” table, and “contribution” lookup table.